Could our gadgets really soon be charged through a tap? Samsung Electro-Mechanics (SEM) has unveiled one of its parent company's mobile phones being powered by a fuel cell that breaks down water into oxygen and hydrogen, which then react again to generate electricity for delivery to the device. 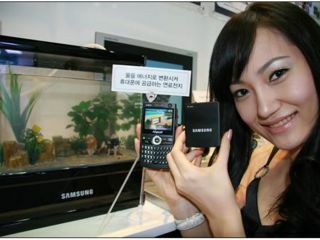 The three watts of electricity supplied by the cell are more than enough for the demands of phones or similar mobile devices, and can power the prototype Samsung setup for up to 10 hours. SEM reckons we should be seeing water-powered gadgets by 2010, which - if other fuel cells are anything to go by - really means that we'll get them around the time man colonises Mars.